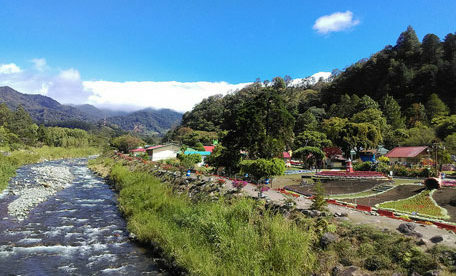 Boquete is a small town on the Caldera River, in the green mountain highlands of Panama, in western-most Chiriquí Province, about 60 km. from the border with Costa Rica. Because of its altitude, some 1,200 meters above sea level, its climate is cooler than that of the lowlands. Its scenic location, temperature, and natural environment make it extremely popular with Panamanians, and attracts tourists from all over the world. Day 1: You will be picked up at your hotel at 05:45 am to check in at Albrook airport for the 07:00 am flight to David: 40 flight. From there a chauffeur will take you to Boquete highlands (about 30 minutes). You will stay at the Boquete Tree trek hotel: lovely bungalows at 5500 feet of altitude in the heart of the Geisha coffee plantations! In the afternoon, will start the coffee tour: discover all about this plant offering one of the most consumed drink in the world. Form the green beans to the roast process you will know all about it. And of course taste it! And have a great opportunity to purchase the best at best price. The night will be just perfect: with just the wild night life reminding you are in the heart of the primary highland tropical forest! You will wake up and enjoy a healthy breakfast. Day 2: In the morning, you can fill with adrenaline slipping in the zip line of Canopy de Boquete. The afternoon is free: you can rent horses for a walk, go rafting on the river, or take a walk on the many paths around the town. For lunch and dinner, Boquete offers many restaurants in this place known to be the #4 place to retire in the world. Day 3: The third day in the morning you will walk by the hanging bridges of Boquete. At 04:30 pm , your chauffeur will pick you up and take you to the airport in David to take the 06:15 pm last flight to Panama city. At arrival another chauffeur will give you the last ride to your hotel in Panama city.